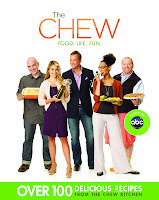 Coqui the Chef: Guess who's on "What NOT to Wear" and "The Chew"? Guess who's on "What NOT to Wear" and "The Chew"? I bet you can't guess who's going to be on "What NOT to Wear" and "The Chew" on Friday September 6, 2013. Coqui the Chef's founder Tania Lopez will be starring on both shows. You don't want to miss out on the fun, laughter and tears. If you have Facebook we created an invitation to help you remember the date and time of the shows. If you don't have Facebook, jot down the date and time on your calendar, smartphone, etc. NOTE: On the day of the shows, we will have a LIVE Twitter and Instagram Party to answer questions and comments.